Samsung finally announced their latest smartphone Samsung Galaxy S8 and S8+ that features Infinity Display, a bezel less design and a curved AMOLED screen just like the previous Edge devices. Both models have bigger screen, the S8 has a 5.8 inches display while S8 Plus also has 6.2 inches. Runs on the latest Android 7.0 Nougat operating system powered by Exynos 8895 processor and 4GB of RAM. For the storage, both have 64GB internal that can be bumped up to 256GB thru microSD support. For the camera, the two sports a 12-megapixels rear camera and 8MP for front side that also serves for iris scanner and facial recognition security features. Both network posted the availability date to those who are interested for pre-order. Mark your calendar and save the date, the new Samsung Galaxy S8 and S8+ will be available for pre-order beginning April 17, 2017 through Smart and Globe Postpaid plan. If you’re planning to avail this unit you can visit to respective network website when the pre-order page is available or head to the nearest stores to inquire for details. Update: Check out Globe S8 and S8+ postpaid plan price and cash out. 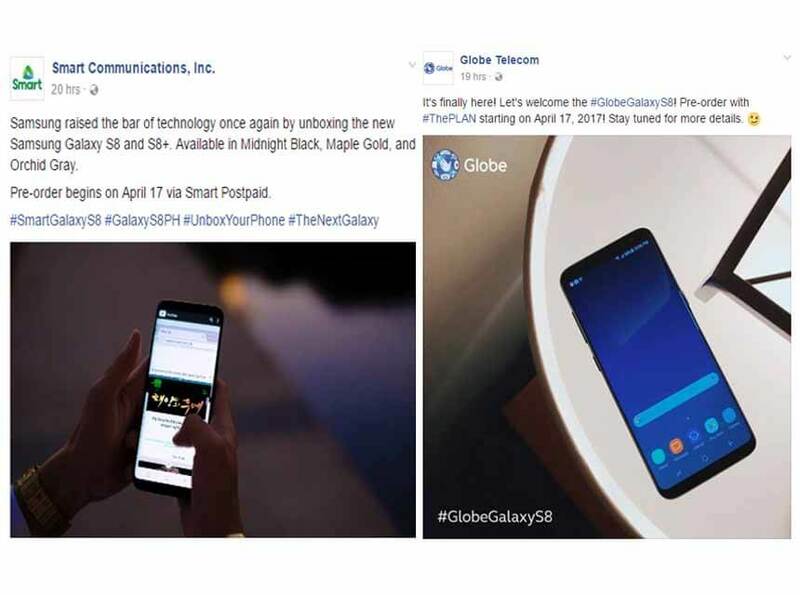 We’ll keep you posted on what the particular postpaid plan for Smart and Globe to offer with Samsung Galaxy S8 and S8+. For Globe, they already hinted that this device will soon be available on the new The Plan postpaid.